Thanks to the overturning of federal laws, we can now provide you with a Scarlet Pearl Sportsbook review. The Scarlet Sportsbook only a 10-minute drive north of Biloxi across a bridge and near the waterfront. You have legal sports betting and a perfect view of Little Island while you are at the Scarlet Pearl. With a waterfront location, the Pearl is an excellent location for you to make your sports bets in Mississippi. As you read this page, you will learn about what the Sportsbook provides for its patrons, such as lounging options and food. You will also learn about the rules and regulations that you should be aware of while you are here. There will also be a section dedicated to teaching you about the history of sports betting in Mississippi and the Scarlet Pearl. When Did Scarlet Pearl Sportsbook Launch? The Scarlet Pearl Sportsbook, powered by Draft Kings, launched on November 16th, 2018. Mississippi began taking sports bets on August 1st, so it wasn’t too long afterward that the Scarlet Pearl started their operations. This happened so recently because the Professional and Amateur Sports Protection Act (PASPA), a federal law, was overturned by the Supreme Court earlier that year. PASPA previously prevented sports betting in the United States. That is part of the reason why sports betting was so popularized in Nevada for so long. Now that, PASPA is gone, you can enjoy wagering on sports at the Scarlet Pearl. Where Is The Scarlet Pearl Sportsbook Located? How Old Do I Need To Be To Bet At Scarlet Pearl Sportsbook? The minimum age to gamble in the state of Mississippi is 21 years old. This means you must be 21 years old to take part in sports betting as well. You will not even be allowed on the casino floor until you reach that age. Does Scarlet Pearl Sportsbook Offer Full-Service Sports Betting? You can enjoy all the same kind of wagers you would take part in at Vegas because the Scarlet Pearl offers full-service sports betting. You can bet on a number of sports such as baseball and basketball in both the professional and collegiate leagues. Parlays, straight bets, and teasers are among some of the ways you can wager on sports here. There are no restrictions so feel free to bet one Ole Miss or whatever team you want to bet on while you are here. The Scarlet Pearl Sportsbook has both a full bar and a full menu of food for you to enjoy while you wager on sports. You have a wide variety of seafood that is available here. You can get Oysters on the half shell, shrimp, or a catfish po’boy while you are here. You can even get 50 cent wings as a special offer while you are here. There are a large number of craft, domestic, and import beers available for you to as well. Beer buckets offer five bottles per bucket, so bring your friends when you visit. In the future, you will be able to use your mobile device to bet on sports while you are at the Scarlet Pearl Sportsbook. Even though you are technically allowed to do mobile wager while you are there now, there are no mobile apps from the Mississippi sportsbooks that are currently available for you to use. There is legislation in the works that aims to change that. When mobile sports wagering fully launches, you will be able to skip the lines and bet more comfortably at the Scarlet Pearl Sportsbook. Live betting is one of the best ways to sports bet. Live betting allows you to make bets on games that are currently in progress. One of the things you can bet on during a live game is who is going to score next. The Sportsbook will provide you live odds for live bets as well. Live bets is another way for you to wager on sports and it can potentially increase your winnings as well. What Are The Promotions At The Scarlet Pearl Sportsbook? 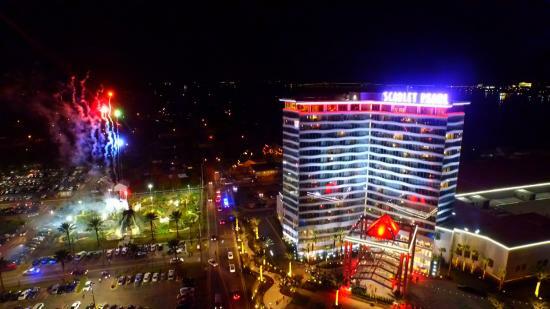 There are plenty of promotions you take advantage of at the Scarlet Pearl. If you decide that you want to sign up for the Pearl Rewards Club, you can receive $10 free slot play instantly for the day you signed up. You will also be rewarded with a Passport to Pearl and have offers such as free lunches and you can also earn $50 in free slot play. If that isn’t enough slot plays for you, you can also win $250 more in free play. How Do I Sign Up For The Pearl Rewards Card? Like most players card in Mississippi, you will need to go to the Scarlet Pearl Casino for you to be able to sign up for the players club. Ask the friendly staff for help if you are unsure of where to go. There are five tiers available. You can move up a tier with the more points you earn by playing casino games. One of the rewards you can earn is you can get an early hotel check in so you can get in faster than anyone else. If you end up with the E.I.P card, you can also earn a free four-night stay at the Sonesta Maho Beach Resort in St. Maarten. Now that is a reward to look forward to! Can I Parlay My Bets At The Scarlet Pearl Sportsbook? The simple answer is yes, you can parlay your bets at the Scarlet Pearl Sportsbook. If you weren’t able to, then that means that the sportsbook would have been limited with its other options as well. Parlaying your bets is a great way to earn more winnings for your bets. The sportsbook representative at the Scarlet Pearl will be able to give you all the details on how you can parlay your bets and tell you if there are any limits on how much you can parlay.